While it’s easy to get caught up in the hustle and bustle of the holidays, set aside some time to do a little baking. Making your own Christmas cookies is a lot more fun than picking them up at the store. You can spend time with family, get the kids in the kitchen, and make something seasonal and delicious. All you need are the right ingredients, a stand mixer, and some holiday cheer. Gingerbread is one of my favourite holiday flavors. Whether I’m sipping on a warm Gingerbread latte or helping the little ones construct their gingerbread houses, I try to get as much in my system as I can this time of year. 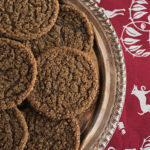 With these soft & chewy gingerbread cookies on the menu, you’ll have no problem getting your fill. They’re a little bit sweet and a little bit spicy (don’t you just love ginger?). They’re perfectly chewy – but the coarse sugar on the top gives the added crunch for those that might prefer a crisper cookie. Whether you’re putting these gingerbread cookies out for Santa or taking them to the neighbourhood cookie exchange, they’ll be a welcomed change from the standard gingerbread men. In a medium bowl, stir together flour, cinnamon, baking soda, cloves, ginger, nutmeg, salt, allspice and baking powder. Set aside. With a stand mixer on medium, beat butter until creamy. Add brown sugar, molasses and egg, beating for 1 minute or until fluffy. Reduce speed to low. Gradually add flour mixture until thoroughly blended. Cover and refrigerate several hours or overnight. Roll rounded tablespoons of dough into balls and roll in turbinado sugar. Arrange balls on parchment paper 2 inches apart. Bake 9 to 11 minutes or until cookies are lightly brown on edges. Cool on wire rack 2 minutes. Remove from parchment paper to wire rack and cool completely. Store in an airtight container.